@Romi's Studio: I did it! Congratulations! It looks fabulous. As always, what a beautiful job. I like the shape of that - not too long and baggy. I hope you'll get some weather for wearing it come next fall. Your new sweater looks great! I didn't know your pins had been featured in Knitters - congratulations! 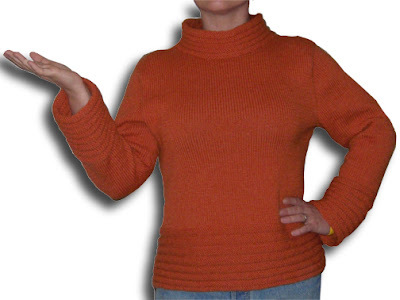 Your sweater is absolute knitting perfection: the pattern, the knitting, the fit and the construction are fabulous. I have been so anxious to see it done -- now get to that Peacock Shawl!! XXXXX XXXXX XXXXX XXXXX -- these are my crossed fingers and toes that my peacock yarn arrives today! Beautiful sweater, Romi! I predict that this one is going to get lots of wear; it looks so comfy! Congrats on more national exposure for your pins. I Love it Rosemary!! It couldn't be more perfect! AND...congrats on getting it done...Perseverance, again..pays off! And, something new in your closet...as you would say...Yahoo!! Wow, that is *gorgeous* and a lovely colour. Well done in finishing, aren't you glad you kept going? The mail has come and gone -- no peacock :(. Wow! I mean, absolutely and totally: WOW!!! You know that I'm totally in love with this sweater since I saw your first progress pics - this is definitely one of the most beautiful ones I've seen for long! And you knit it up so perfectly, it looks stunning indeed! Perfect shape, awesome colour, beautiful pattern - yep, it's perfect! Congratulations on an awesome accomplishment! I'm so glad to hear that word is getting out about your pins! Good news all round! Fab sweater! I love the colour. And woohoo for pin publicity! I took the link to Lana Grossa but didn't find that booklet. That's a very smart looking sweater. Congrats on all the good press, you deserve it! Congratulations! Wow, look at that. Gorgeous! What a great match of color and design. You wear it well!